My name is Naeem Solo. I would like to share the most amazing experience that I have ever had in my life with everybody that reads this letter. Alhamdulillah by the Qudhrat and mercy of Allah, Crescent Lifestyle gave me a once in a lifetime opportunity to visit to the holy sites, the Grave of Rasulullah (SAW) and The House of Allah, Baitullah. I would like to make shukr to Allah for giving me this chance, to perform my very first Umrah, and my first visit to the holy lands, which I never thought would happen to me. May Allah Reward and bless Crescent lifestyle for the great service they are proving to the Muslim community by making it easy for people to live their dreams of performing Umrah, Subhanallah. When I embarked on the flight to Jeddah I couldn’t believe that really finally, Allah has invited me to visit the Grave of Rasulullah (SAW) and to Baitullah. On the plane tears could not stop running down my cheeks. I continuously read Labaik Allahuma Labaik. I had wished to go for Umrah with my wife but due to financial constraints she did not accompany me. Allah knows best. I had no bank authorization to use my bank account overseas or cell phone access. I made continuous dua to Allah because I was travelling 19000km with only R170.00. I relied solely on Allah and prayed that He would provide for me. In Medina I was directed to the masjid of My Nabi SAW, where I made my 2 rakaats of Salaatul Masjid and I walked to the side of the Qabr and sent my salaams to Rasulullah (SAW). Madina Munawarah is a peaceful place; one can feel the sakeena descending from the heavens. My stay in Makkah was as amazing and blessed as my stay in Madina Munawwar. My lesson from this beautiful and spiritual experience was that Allah taught me Yaqeen and the beautiful gift of Tawakkul. May Allah continue to bless Crescent Lifestyle for their outstanding work they are doing for the Deen in all aspects and may Allah bless it to grow bigger and bigger, ameen. I might not have had this amazing opportunity if it wasn’t for Crescent Lifestyle. I would like to Thank Crescent Life style for making this possible through Allah’s mercy. Ameen, ameen Ya Rabbul Alameen. 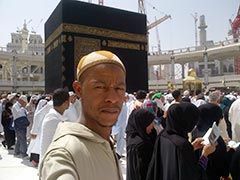 He won R10,000 towards Umrah.